Aesthetics can be described briefly as the instance of reflection of aesthetic judgements. In this respect, landscape aesthetics means the instance of reflection of landscape-related judgements. Theoretically and methodically, this topic area is approached from different perspectives. Philosophical aesthetics focuses on the examination of the conceptual connections between aesthetic judgements and landscape, social science on the emergence and function of social aesthetic conventions, psychology on landscape preferences (the intensity of the references or the potentials of these are summarized in the Table 3.1). As with landscape research, different preferences are also given to the individual, the social and the material in aesthetics, whether for example the ‘beautiful’ quality of an object, or a social or individual attribution. 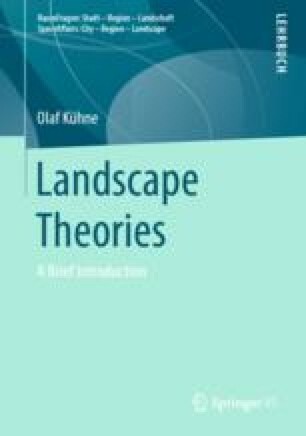 In relation to landscape, the aesthetic assessment is not limited to the ‘aesthetic tripole’ (Seel, Die Kunst der Entzweiung. Zum Begriff der ästhetischen Rationalität, Frankfurt a. M., Suhrkamp, 1996) of the beautiful, the ugly, and the picturesque, but is extended to other contexts—up to a connection to moral and ontological references. A further peculiarity of a landscape-aesthetic turn to the world lies in its multisensory nature, although optical stimuli dominate in the perception/construction (depending on the chosen theoretical access) of landscape, acoustic and olfactory stimuli in particular have a special significance—which has so far received comparatively little attention in landscape research—with the exception of phenomenological landscape research (Sect. 2.5.1).